The Menagerie has been delivering regular variety shows at Wellington’s Fringe Bar for almost two years now. The company is dedicated to bringing together different acts from different genres and creating as diverse a show as possible. 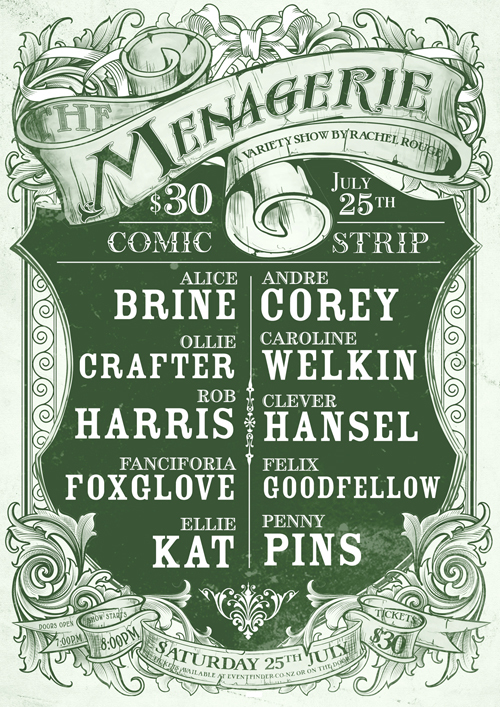 This month The Menagerie have restricted themselves to only two live performance genres: stand-up comedy and burlesque. This special edition of The Menagerie is subtitled ‘Comic Strip’. On Saturday the 25th of July the line up includes stand-up comedians; Rob Harris, Alice Brine, Ollie Crafter and Caroline Welkin. As well as burlesque artists; Clever Hansel, Penny Pins, Andre Corey, Fanciforia Foxglove, Felix Goodfellow and Ellie Kat (the last two are the same performer in different guises). Special edition COMIC STRIP Menagerie is at 8pm at The Fringe bar, Wellington, Saturday the 27th of June.